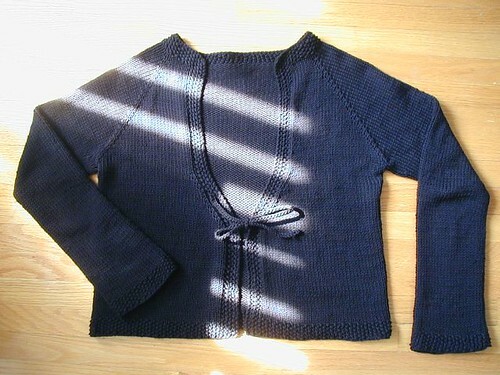 Cavern is a top-down cardigan in one piece. It features a seed stitch edging, almost-straight sleeves, cropped length and front tie-closure. Inspired by glampyre’s minisweater pattern. All rows: *k1, p1* across to last stitch, k1. Switch to stockinette stitch on next row. Next row (RS): (k1, p1) twice, k8, pm, k11, pm, k25, pm, k11, pm, k8, (p1, k1) twice. 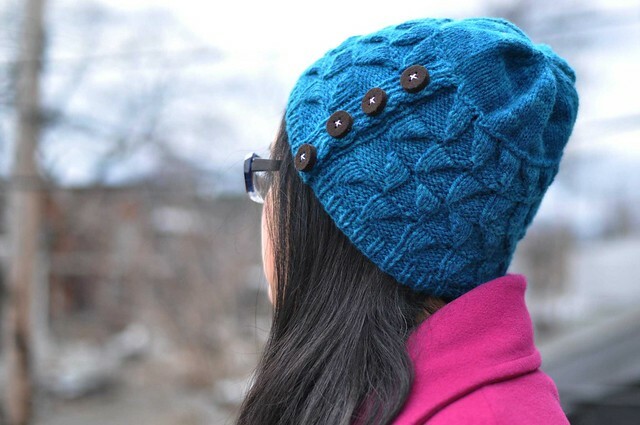 You will be keeping the first and last 5 stitches in seed stitch – knit the purl stitches and purl the knit stitches. Next row (WS): 5 sts seed st, purl across to last 5, 5 stitches seed st.
Increase row (RS): 5 sts seed st, *k to 1 before marker, kfb, sl m, kfb*, repeat * to * three more times, k to last 5 sts, 5 sts seed st.
Repeat the last 2 rows a total of 21 times (total 42 rows). End with right side facing for next row. Separate sleeves and body: 5 sts seed st, *knit to next marker, slip stitches between next 2 markers onto scrap yarn*, repeat * to * once, knit to last 5 stitches, 5 sts seed st. Try on your sweater to adjust raglan length to fit. Work one WS row even. Increase row: 5 sts seed st, k1, m1, k to last 6 stitches, m1, k1, 5 sts seed st.
Repeat these last 2 rows 13 times (total 26 rows) or until the two fronts meet to your satisfaction. Discontinue increases and continue evenly in pattern, keeping first and last 5 stitches in seed stitch and the rest of the body in stockinette stitch, until piece measures 10 inches from underarm or 1 inch less than desired length. Place stitches from one sleeve section onto dpn or small circular. Rejoin yarn and pick up and knit one stitch from body underarm. Place marker and begin knitting in the round. Decrease round: k1, ssk, k to 3 before marker, k2tog, k1. Repeat these 6 rounds a total of 6 times or until desired narrowness. Discontinue decreases and knit evenly until sleeve measures 17.5” from underarm or 1” less than desired length. Pick the point on the fronts where you want the ties to be and mark on each side of front with safety pins. Using crochet hook, pick up one stitch from marked spot. Chain 10”, the work one row slip stitch back to the beginning of the chain. End with a slip stitch into the front edge of cardigan and bind off. Repeat for the other side of cardi. Weave in ends.